Deciding How To Save For Retirement - TSP or Roth TSP? What's Better? TSP or Roth TSP? Which One Should You Be Saving In Today? When TSP added the Roth option, you gained a tax planning option—but you’re also faced with making another decision! Many people find this a challenge because there’s not one right answer for everyone—and it depends upon several factors. When you contribute into Traditional TSP (which I will refer to as TSP for simplicity), you get to defer paying Federal and applicable State income taxes on that contribution amount. This means you will be delaying any income tax until you withdraw money from TSP later. TSP withdrawals are taxable, subject to Federal and applicable State income tax. The thinking behind TSP is that income tax deferral is advantageous because you’re expecting to be in a lower tax bracket in retirement. That means you’re expecting to pay less income taxes on your TSP withdrawals in retirement. If that’s the case, then tax deferral may be advantageous. The Roth TSP works the exact opposite. When you contribute to the Roth TSP, you pay Federal and applicable State income taxes on that amount. This means that you are paying the income tax on the contribution now. However, Roth TSP withdrawals may be income tax free—if you follow IRS requirements (five years have passed since January 1 of the year you made your first Roth contribution, AND you are age 59½ or older). Click here for TSP Withdrawal information. 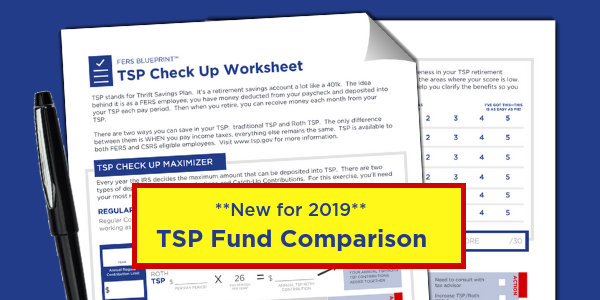 The thinking behind Roth TSP is that tax free withdrawals are advantageous because you’re expecting to be in the same or higher tax bracket in retirement. When you pay income taxes now on the contributions, you’re expecting taxes to be the same or higher in retirement and have tax free Roth TSP withdrawals. If that’s the case, then paying income taxes now may be advantageous. Keep in mind that the Roth TSP is not a Roth IRA. Unlike a Roth IRA, there are no income restrictions on contributions to the Roth TSP. If you’re eligible to contribute to TSP, you can contribute to the Roth TSP no matter how much you earn. Many people just blindly assume that they’ll be in a lower tax bracket in retirement. That’s because you’ve been told again and again, “You’ll be in a lower tax bracket in retirement because you’ll be earning less.” For some people, it’s true. They are in a lower tax bracket in retirement. But that may not always be the case—there’s a possibility that you may actually retire into a higher tax bracket than you’re in today. One factor that's worth considering is how Required Minimum Distributions (RMD) may substantially increase your taxable income. Tax brackets have changed since the advent of the tax deferred retirement savings accounts—and with the changes, the assumption about a lower tax bracket might not be true for you. You may retire with more income than you have today and/or income taxes may increase. What that means is proper tax planning should definitely become a part of your retirement preparation. Now For The Million Dollar Question—What Should You Do? We know how hard it can be to find the right information so that you can decide on your TSP savings strategy. It’s worth it to figure it out because your TSP is vital to your retirement security and comfort. 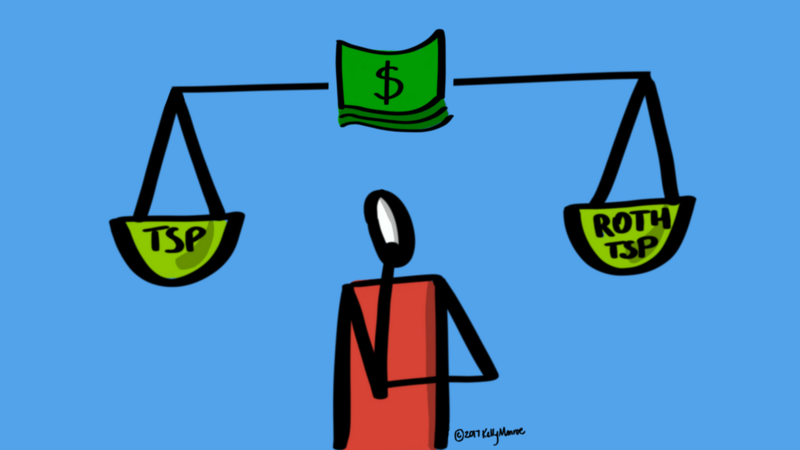 TSP and Roth TSP Comparison Matrix This resource compares the tax implications of 4 different scenarios. Is Roth Right For You? Thrift Savings Plan Highlights Jan/Feb 2012 This article lays out the features of the Roth TSP. Paycheck Estimator This calculator helps you estimate how contributions to TSP or Roth TSP will affect your take home pay. Contribution Comparison Calculator This calculator gives you a side by side comparison of TSP and Roth TSP contributions. Remember that you don’t have to go it alone. Another resource is your tax professional. You can discuss your current income level and the tax bracket that you’re in. You can also learn how Federal income tax is calculated, and if applicable, State income tax. If you can provide the tax professional with estimates on your retirement income from your FERS pension, Social Security, approximate TSP withdrawals, and, of course, any other sources of retirement income that will help them guide you in your decision. This decision to save in TSP and/or Roth TSP comes down to whether you would be better off paying taxes now or later. No matter what your decision, remember to review your options every year so you can make changes as needed.